This could be useful for a lot of things, like reaching stuff that’s too far away or too high up, distance high-fiving, and changing the channel on the TV without getting up from the couch if you dropped the remote! This would also be a horrible thing for a proctologist to have. And if that doesn’t work, scale the building’s exterior with your grapple hand. *sings* I’m so handy, you already know…. Ooh, new Biff comics! Have missed them. Oh hell yes, you said it. Sweet beautiful Biff comics, god I missed these. 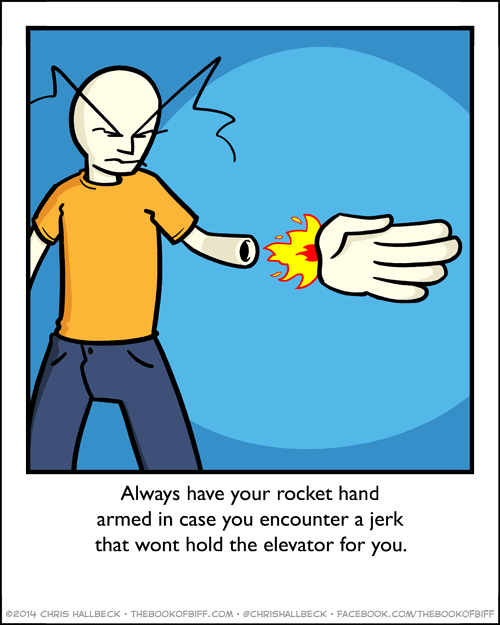 Keep your Rocket Hand strong!